Many blog owners are scared and hesitated to move their blog to another domain because they fear to lose their visitors, downtime and other complications. I will show you now how to get rid off this fear and how to avoid problems while you moving. 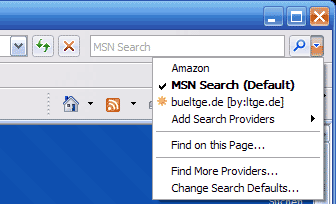 Nowadays search field in your browser improved quite a bit, even IE supports OpenSearch format. But what is so great about OpenSearch and how easy it is to use with your WordPress installation has two aspects: WordPress comes already with OpenSearch and it's easy configurable with XML. You just have to put a link in your theme and a xml file on your server to let the browser know that your blog supports the search field. So go ahead and improve your Plugin with little work and no use of a Plugin. The following code should explain it. Adjust the syntax and link to the favicon and xml-file. After you uploaded both files (favicon.ico und os.xml) add a link into the header.php of your theme. You can use the code one by one if you put os.xml in your root. After that it's possible to integrate your blog in Firefox and Internet Explorer. 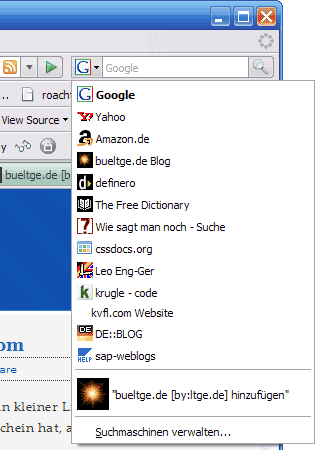 The declaration of each XML tag is well documented on the OpenSearch website. Copy code, adjust and save as os.xml, then upload on your server. Not only the design changed since version 2.5. Also the markup was changed immensely, so there might be changes in the editor area, if you use pluigns, which implements data there.